This is such a FUN look. And very easy to create. You can cover just about ANYTHING; big or small, including FURNITURE! 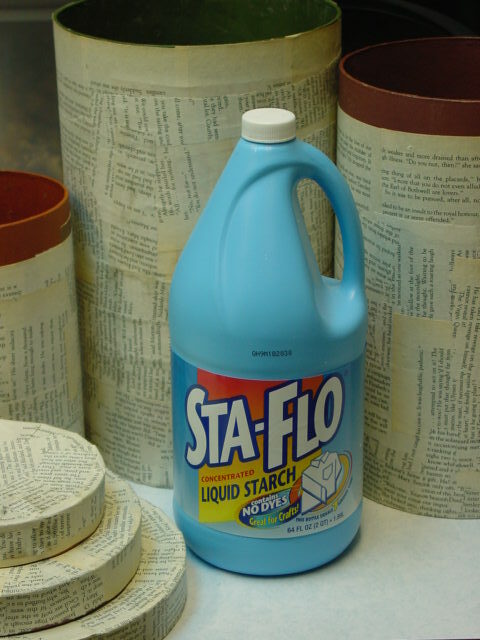 All you need is some LIQUID STARCH; I’m using Sta-flo, as shown here. There is another brand called Vano that works just the same. Depending on where you are in the world, there may be different brand names; but good old-fashioned liquid laundry starch is pretty much all the same. Don’t worry about the pale blue color of the starch, it dries clear. 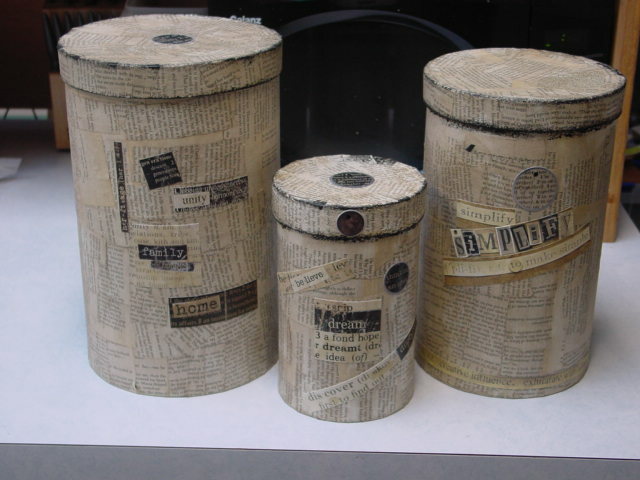 I covered these garage sale paper mache canisters. 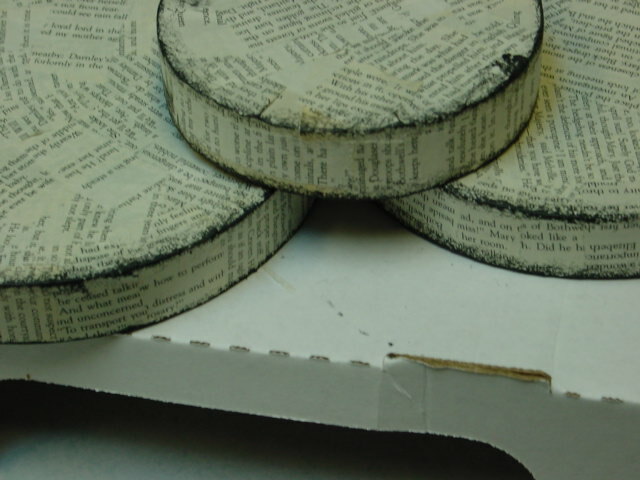 FIRST you’ll need to tear out your book pages and tear them up into smaller pieces. I do this while I’m watching TV, and I just keep a stash of torn pages on hand all the time so that when inspiration strikes, I can ‘get right to it’ and not have to sit and tear pages until my fingers ache! For things like these lids, you’ll need really small pieces. To use the starch, SHAKE the bottle well. Pour about an inch into a shallow pan of some sort. Keep a damp towel nearby to wipe your hands off with. Then just dip your strip of paper in the starch being sure it is fully covered. Squeeze off the excess starch and slap in onto your object. 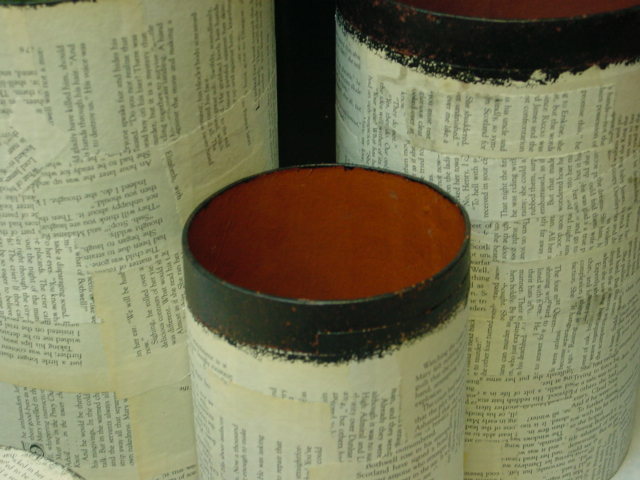 If you are covering something with LIDS, like I have here, be sure there is enough ROOM for that extra layer of paper on the rim. On this set, only the largest box had extra room. The other two I had to leave the space for the lid unpapered so the lid would still fit. Slightly overlap your pages as you go. Let dry overnight. Sometimes during the drying process some of the edges will curl up. This is easily remedied by applying a drop of starch and rubbing it back down into place. Since I wasn’t able to apply paper all the way to the top of all my canisters, I covered that space with some black paint, using a sponge painting method. I also sponge painted the edges of my lids. 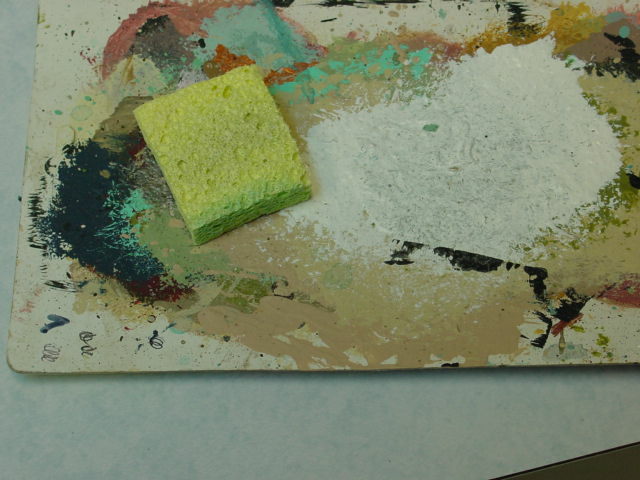 I use the sponge painting method quite frequently. It’s fast and easy and doesn’t require any fancy expensive tools. You need PAINT, a little piece of a regular ole household sponge and a ‘palette’ for your paint. 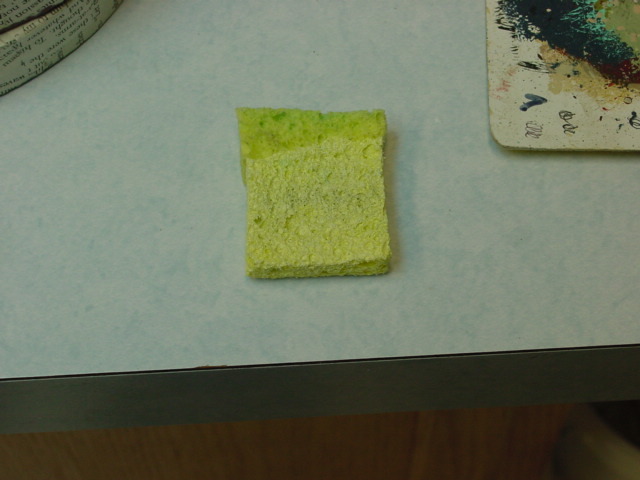 VERY LIGHTLY dampen 1/4″ end of your sponge. I put a teensy bit of water on a plate and tap my sponge into it for ONE SECOND. You can see in the above photo how much of the sponge has taken on water. Wring it out in a towel to remove as much excess water as possible. You want it to be ‘soft and pliable’, NOT wet. Here’s my fancy paint palette! Add a small amount of paint; I’ve used black. 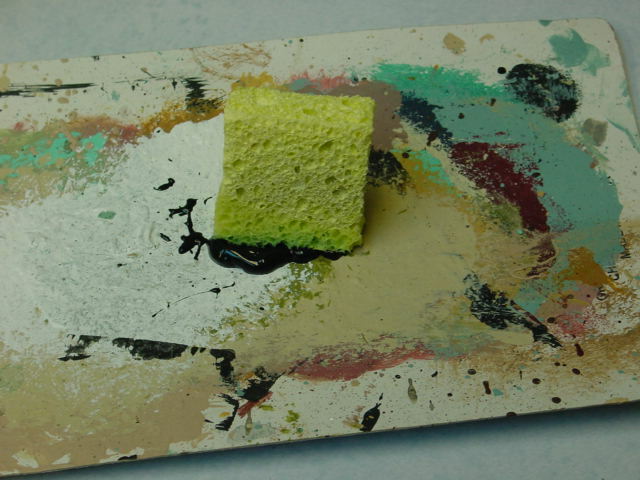 ‘Load’ the softened end of your sponge with the paint by gently tapping it in the paint to coat evenly. MOST IMPORTANT STEP! 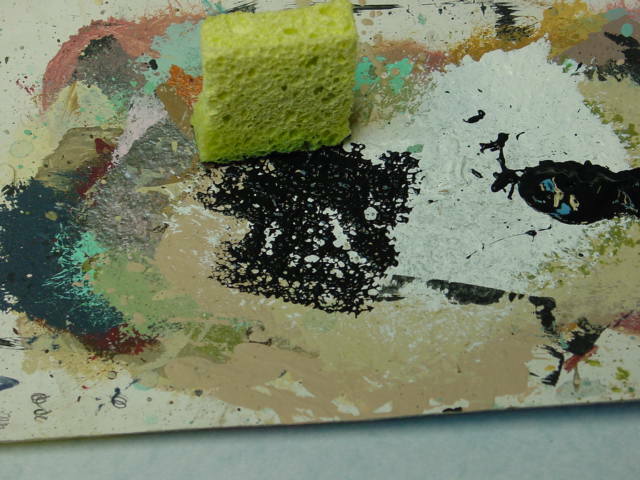 Dab your sponge on a dry area of your palette to work off some of the paint so that there isn’t any ‘visible WET paint’ on the surface. Do a couple of ‘test dabs’ on a piece of newspaper and see how it looks. You should be getting about 50% coverage each time you dab. It’s kind of an ‘airy’ splotchy look you are going for; not FULL coverage. If you are unsure, go LIGHTER! You can always go back and add more; but you CAN’T remove excess! I decided to add some scrapbook embellishments to mine. But I see a lot fo them just left ‘as is’ with the book pages. You can paint or stamp on top of the paper . . . whatever you want! If you are papering furniture and want a more wear resistant finish, you can apply any kind of varnish on top of the paper once it’s fully dry. BUT, if you leave it UNvanrished and change your mind later on, you can remove the starched paper by simply WETTING it and peeling it off! I’ve covered several lamp shades using the method. Sheet music is fun to use too! 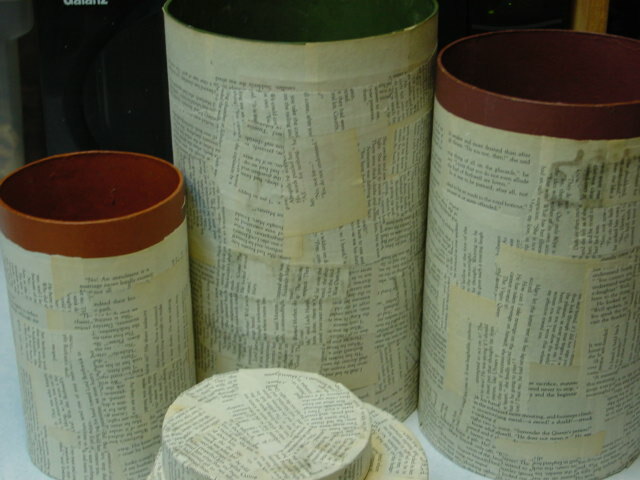 What do YOU want to cover with book pages? 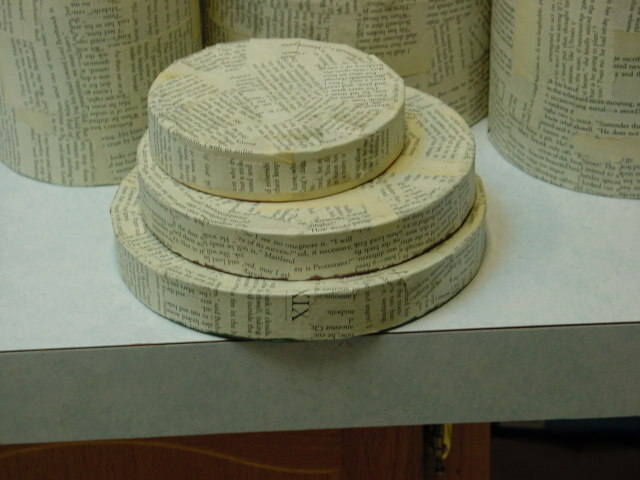 I’ve covered many things with book pages – my favorite perhaps is the tray that I then put my daughter’s silhouettes on. 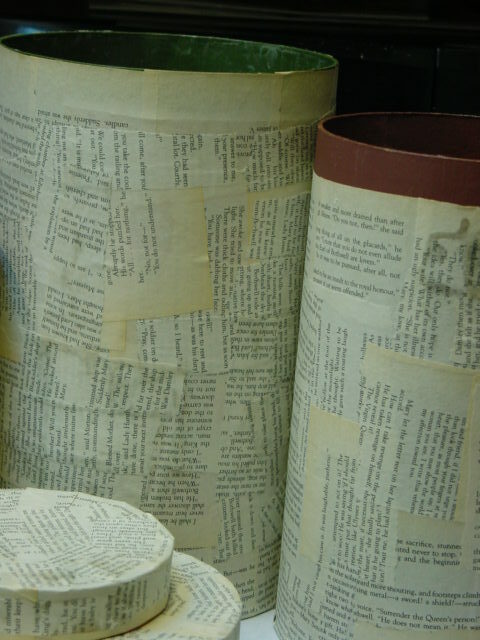 I love things covered with book pages….I haven’t done it for awhile…need…to…do…it…again. I have just found your site….it’s really awesome to see your before/after pictures of things & all your ideas/tips. 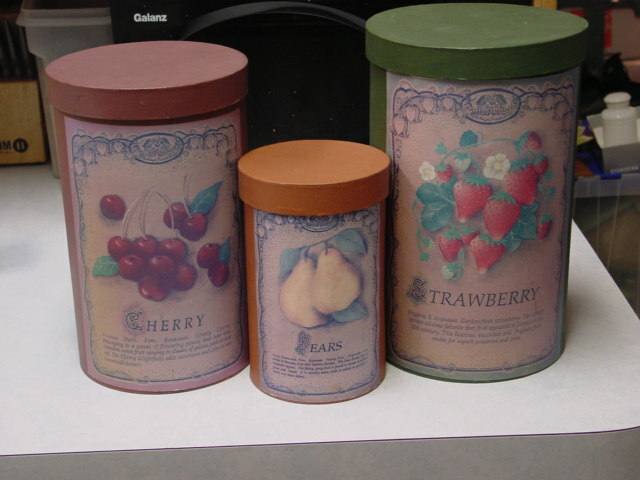 I just papered a popcorn tin from christmas with a hymnal we didn’t really know many songs in… It’s great size for trash can, but kinda tacky looking otherwise. I’m waiting for this to dry tonight! I also tried a lampshade. Just the outside for tonight, but inside is next. You are right this can be addictive. I Really want to try some furniture soon! Thanks for your info. & time. Found you on Pinterest. Thorough tutorial. Very appreciated. Have some canisters I’m going to do now. Thanks for the inspiration. Here I am, another Pinterest follower. Love this tutorial and I am on a mission now to find something to ‘cover’. When I put it on my blog I will be sure to reference your blog here! Thank you for posting and I can not wait to browse the rest of your blog. Love idea! I have a large tin I’d like to try this on. Have you tried it on metal? Just out of curiosity, what’s the difference between covering with liquid starch and just plain modgo podge or Elmer glue? If there is any.. The biggest difference is that starch is CHEAPER and easier to work with. 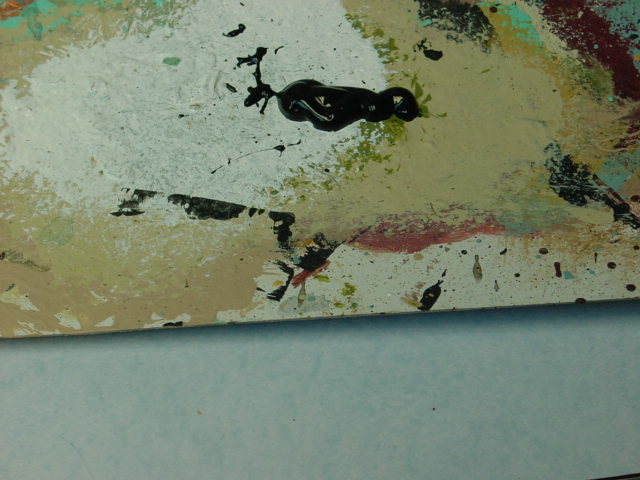 Just hand dip each piece of paper, squeegee off the excess liquid between your fingers and slap it into place. ALSO, because the starch is WETTER, you can apply a second coat of paper immediately on top of the first while it’s still wet WITHOUT needing to dip the pieces at all. They will soak up the starch that is left on the surface. And it’s ‘removable’ if desired. Like when someone papers a WALL, or furniture. It could easily be removed later on by just re-wetting and peeling off. 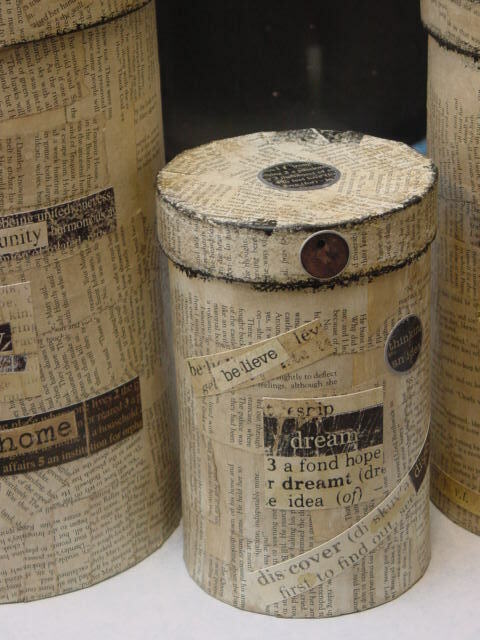 For PERMANENCE, apply a coat of Mod Podge or varnish on top of your final coat after it’s completely dry. Is the white film from the starch? 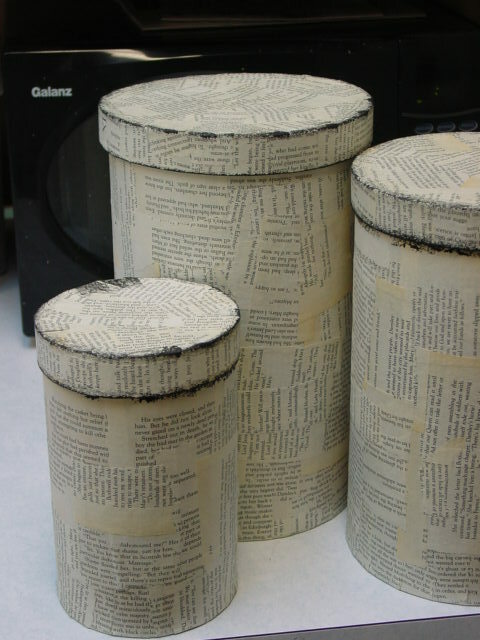 Can you only do this to paper boxes, or to metal ones too? This is a great idea. You would probably need to use a different kind of ‘adhesive’ for metal boxes. I’ve never tired it on metal, so I cannot make a specific recommendation. Thank you for sharing. 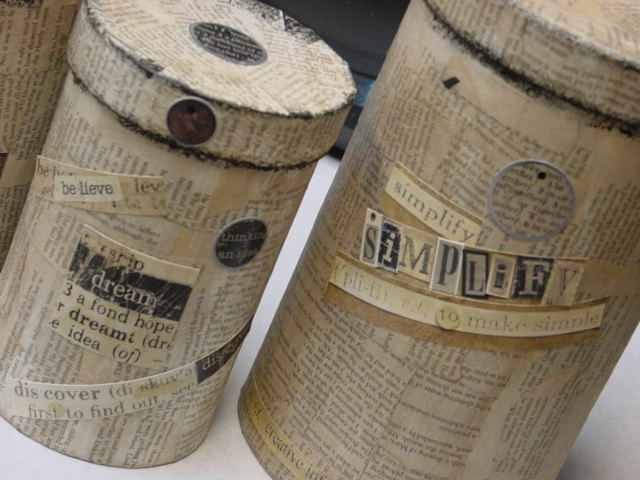 I am going to repurpose oatmeal boxes in my crafts class with this idea!! Bless you! We need thrifty ideas. GREAT Tuto, thanks very much ! I’m loving this… I’ve got some styrofoam balls which I’ve used with glue and book pages to make Christmas ornaments… starch would be a lot cheaper, BUT would the usage of starch attract bugs during storage?? I’ve never had bugs on my boxes or balls that I used starch as the adhesive for.